When chemical companies hired Grant Gillham in 2007 to manage a campaign in defense of flame retardants in couches and other consumer goods, Gillham recalled being "assured that the scientific information they had supporting the safety and effectiveness of their products was valid." The companies' claim turned out to be a "big lie," Gillham, a corporate affairs consultant who has also worked for the tobacco industry, told The Huffington Post. Flame retardant makers, according to Gillham and other advocates and experts, are following a playbook first drafted by lead paint manufacturers in the early 20th century, revised and expanded by Big Tobacco in subsequent decades, and chock full of legal and public relations tactics designed to preserve profitability, with little regard for public health. All three industries are currently embroiled in ongoing legal battles tied to health concerns. Sources told HuffPost that they recognize many of the classic moves, from deception to denial to delays. "It's déjà vu all over again, and again," said Steven Gilbert, director of the Institute of Neurotoxicology and Neurological Disorders and affiliate professor at the University of Washington. Chemtura, a leading manufacturer of flame retardants, filed a lawsuit in mid-January seeking to overturn California's newly enacted fire safety regulations. The revision of Technical Bulletin 117 dissolves a decades-old state requirement -- and de facto U.S. standard -- that flame retardants be included in upholstered furniture. The change was spurred by mounting evidence of health problems associated with exposure to the chemicals, as well as an investigation by the Chicago Tribune that found the additives may offer no meaningful fire protection. The company, however, continues to stand by its product. "California's revised, weakened fire safety standard could tragically lead to more fires and more injuries, deaths and property damage nationwide," John Gustavsen, a spokesperson for Chemtura, told HuffPost in an emailed statement. "Flame retardants are extensively tested with regulatory oversight and are safe and effective for their intended use." "Like climate change," Gilbert countered, "the data against flame retardants is overwhelming." It took several decades of accumulated data before the harms from lead and tobacco became widely recognized. Both industries are now attempting to fend off court-ordered penalties for past behavior, including hiding known health risks. Three former lead paint manufacturers, charged by a California court in January to pay $1.15 billion to strip the toxic heavy metal from millions of homes, have stated their intent to challenge the decision. Also in late January, Big Tobacco added another appeal in its fight over a court-ordered advertisement campaign intended for newspapers, websites and prime-time television. The ads, to which tobacco companies had agreed earlier last month, would state that the industry "deliberately deceived the American public" and would highlight the health dangers of smoking and second-hand exposures. Experts suggest the latest appeal is itself an example of industry tactics. With the recent legal maneuvering, the ads are not expected to appear until at least 2015 -- nine years after the original court ruling. RJ Reynolds, one of the companies involved, declined to comment. Another defendant in the case, Lorillard, did not respond to HuffPost's inquiries. Gillham, whose clients included Lorillard from 1999 to 2010, said that he was "not surprised" by the appeal, which argues that the ads would violate the companies' right to free speech. "The industry is run by lawyers whose mission it is to ensure the tobacco manufacturers can penetrate as deeply into the U.S. consumer's mind as possible," he added. Stanton Glantz, a professor of medicine and tobacco control at the University of California, San Francisco, further suggested that Big Tobacco's legacy of well-paid academics, flawed studies and pressure for proof over precaution, continues to influence today's publicly accepted science. "The surgeon general won't say smoking causes something before it's proven beyond all possible shred of a doubt," said Glantz. "That's a ridiculous standard." He noted that while the evidence for breast cancer's connection to smoking is "overwhelming," the surgeon general characterized the link only as "suggestive but not sufficient to infer a causal relationship" in the latest report, published in January. "Whether you're talking about tobacco or global warming denial or toxics in furniture, it's all the same strategies," said Glantz. "It's this whole idea of creating doubt. Then it becomes a 'he said, she said,' and the weight of evidence gets lost." "The net effect is that it's harder to reduce public exposure to these toxins," he added. Andrew McGuire, a burn survivor and MacArthur Grant winner who has spent decades advocating for fire-safe cigarettes, offered the example of the ban on chlorinated Tris in children's pajamas in the 1970s. It took only a few months after the publication of a scientific paper on the chemical's cancer-causing potential for legislation to appear. "Today, that would be unthinkable," he said. "Whenever you have corporations that do bad things and have a democracy taken over by power of corporations, you have bad outcomes. Flame retardants are a classic case." The flame retardants industry is quietly mounting its own information campaign to make its case. 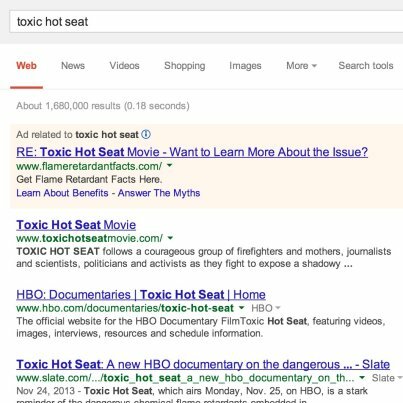 If one searches Google for the new HBO documentary on flame retardants, "Toxic Hot Seat," a paid banner ad appears at the top of the screen that reads, "Get Flame Retardant Facts Here." The link opens a site that offers assertions about the chemicals' safety and effectiveness. The site is supported by the American Chemistry Council, an industry trade group. Kirby Walker, a co-producer of the film, noted that the industry ad has topped her film's search results for months. "They're trying to create doubt. It's a stalling tactic," she said, adding that the tobacco industry had employed a similar tactic. Based on the Chicago Tribune's expose on the flame retardant industry's "decades-long campaign of deception," the documentary also highlights Big Tobacco's role in the initial push to inject furniture with flame retardants as part of its apparent response to pressure to produce a fire-safe cigarette. A well-funded chemical campaign with paid experts and lobbyists followed, with one organization in particular standing out: Citizens for Fire Safety. The now-defunct group described itself as a "coalition" that included fire professionals, educators, community activists, burn centers, doctors and industry leaders. But public records uncovered by the Tribune found that it was simply a front for Chemtura and the two other top makers of flame retardants. Gillham formed and managed the organization. He told HuffPost that he "wrapped the effort around fire safety advocacy," and that his lobbying team targeted 60 pieces of legislation across the country that challenged flame retardants -- and succeeded in blocking 58 of them. But in the wake of the Tribune series, the companies dropped Citizens for Fire Safety and Gillham. "It was like your best friend all of the sudden hates you," recalled Gillham. He suggested the companies are now using him as a "scapegoat." When HuffPost asked Chemtura about Gillham's departure, Gustavesen responded that the company does not comment on "past professional relationships." McGuire questioned Gillham's claims of innocence and ignorance about the science. Such posturing, McGuire told HuffPost, is part and parcel for the tobacco and flame retardant industries that he's grown to know well. Today, added McGuire, the flame retardant industry is likely looking for legal and public relations lessons from an "analogous" lead paint saga. In response to last month's lead paint verdict, which came more than 13 years after the lawsuit was filed, National Lead, Sherwin-Williams and ConAgra maintained in a statement that "the potential harm constituting the alleged public nuisance today was unknown and unknowable when defendants were making and promoting white lead pigments for residential use." Appeals in past suits have been successful, including a 2006 Rhode Island verdict against the industry that was overturned two years later based on a technicality. But David Rosner, co-director of the Center for the History and Ethics of Public Health at Columbia University, thinks the result in California will be different. "The judge understood and was not distracted by their nonsense," said Rosner, co-author of the book Lead Wars and an expert witness who testified in the case. McGuire is similarly confident that Chemtura's suit will eventually dead-end, although he suggested it will take even longer to deal with the toxic flame retardants that already fill American homes. "At some point in time, corporations that make poison, and know that it's poison, and know that it bioaccumulates in humans and in animals, and know that it doesn't go away," said McGuire, "they're gonna be liable."